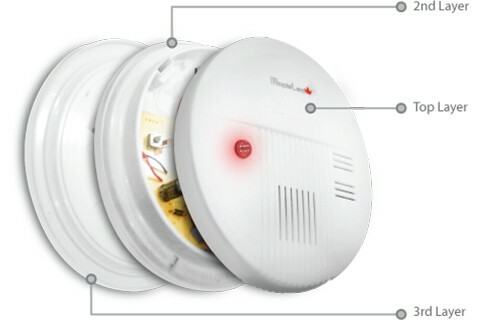 ML-VIII are photoelectric smoke alarms, they are generally more effective at detecting smoldering fires which smolder for hours before bursting into flame. Sources of these fires may include cigarettes burning in couches or bedding. ML-VIII accords with the ISO / DIS12239 Standard. It is important to test this unit weekly to make sure it is working properly. Don't open the alarm by yourself, return them to the seller if improperly ,and don't use fire to test your alarm. Press and hold the test button on the cover of the unit until the alarm sounds. If it does not alarm, make sure that the unit is receiving power and test it again. If it still does not alarm ,replace it immediately or check your battery. The signal flashes once 30 seconds and while it alarms the signal will flash once 0.5 second. If the alarm makes low "chirp "sounds every about 30seconds,it tells you to exchange your battery. Little smoke will not cause alarms, so misinformation occurs only when you blow smoke to the alarms directly or you forget to turn on your ventilated facility white your cooking. Sometimes when you smoke the unit will alarm ,so you can just blow air to it to stop alarming.